You know what Thanksgiving means to me and my family - GAMING! Actually, we game pretty much all year long (as I'm sure you can already tell), but any holiday in our family is especially awesome because we get to be with lots of friends and family. Well this year for Thanksgiving my wife, kids, dog, and I all packed ourselves into our Chevy Traverse and took a trip to Smyrna, Delaware, where my parents live. 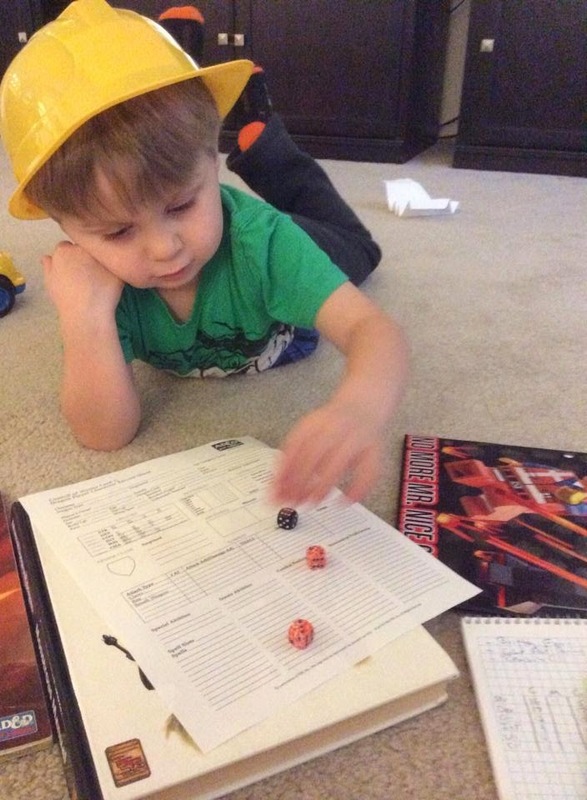 You may have read our play report from Thanksgiving Eve, where I ran AD&D 2nd Ed. Council of Wyrms for everyone in the house. Last night the gaming continued as my cousin Beth and my mom joined Jen and I for some Gloom. If you've never seen or heard of Keith Baker's fantastic card game Gloom, it's worth checking out, especially for you horror fans. Wil Wheaton and company even had a Tabletop Episode featuring the game that is worth a look. Council of Wyrms was sort of an afterthought for the Thanksgiving Gaming Extravaganza… something I tacked on right before leaving Pittsburgh. The real gaming was to occur on the Saturday after Thanksgiving when my cousin Rachel, her fiancé Carmel, and my brother Tom would get together to play Monte Cook Games' The Strange! Despite being a very new game on the market, it wouldn't be the first time, or holiday for that matter, that this particular group of players got together to play The Strange. Last Christmas we had a special game day at my parents house and I had my hands on the playtest rules just after The Strange successfully completed its Kickstarter. I had everyone at the table sign an NDA, and we gave the game a spin! That's right, you heard me correctly… this are 100 foci included in this book, broken up amongst six different categories. Disenchanted covers foci that would be a great fit for historical recursions and/or low, non magical fantasy. Otherworldly are quite the opposite: high fantasy or for use in campaigns where magic is used rather than technology. Pseudoscientific is a neat twist on Mad Science, with hints of comic book superheroes. Earthly (probably the most necessary) is just that: a whole pool of foci that can be used for your Estate agents while defending Earth on home turf. Paranormal seems like a dark twist on psionics. Miscellaneous covers five more specific types of foci, with only a handful for each: Lovecraftian Horror, Mythic, Space, Strange, and Wild West. For example, under Disenchanted you have "Rides a Noble Steed", which although similar to Controls Beasts in Numenera is more specific to having a mount. Braves Dungeons, under Otherworldly, could let you build a very accurate "Thief" character for a recursion mimicking old-school Dungeons & Dragons. "Leaves the Physical World", under Paranormal embraces Astral Projection. One particular favorite of just about anyone who I've met who has had a chance to look at the book is "Dies." Covered under Miscellaneous, Dies is a Space-themed focus that allows you play a redshirt. Each of your Tier abilities essentially has your character dying so that another could come take his place. The Tier 2 power "Meat Shield" has your character dying so that someone else in the group doesn't get hit. Your character sheet only requires you to spend 2 Might points to use this power, but in the game your character dies and another redshirt joins the group instantly. But there aren't just foci in this book, you also get some great recursions to use in your game. Each chapter includes a few places where you could easily fit the proceeding foci, which could greatly expand your campaign with minimal preparation. For instance, under Disenchanted you have Sherwood Forest, a Level 5 recursion that operates on Substandard Physics. Just 100 by 100 miles, this ancient recursion would be the perfect place to send your party if you'd like to see them up to their necks in a much more realistic renaissance festival! The "Steals from the Rich" focus doesn't hurt either! It was Thanksgiving and Agent Jackie Dingo of the Estate was staring at three pictures of turkeys just before translating to the mad science laden recursion of San Fransokyo. Enzo Gorlomi, Antonio Margheriti, and Dominick DeCocco were all known associates of Don Wyclef, notorious gangster and member of Crow Hollow's Beak Mafia. Several days ago, Estate operatives in Crow Hollow witnessed the three no good goons and hit men get into a particularly nasty scrape with a rival gang, forcing them to get out of "tree" for a little while. Each of the goons had the spark, and Gorlomi was quickened, but something must have been wrong with the translation key that the ringleader was carrying. When the three popped out in Trenton, New Jersey they were turkeys. Gorlomi, Margheriti, and DeCocco wasted no time before causing trouble on Earth and getting the attention of Agent Dingo. The three built a small gang in just two days, and then travelled down to Philadelphia where they started to rob high end restaurants, especially those that were featuring special Thanksgiving menus. Earlier Thanksgiving morning, the three were seen breaking and entering into Morimoto, a restaurant run by the Iron Chef of the same name. When Agent Dingo went to meet with Morimoto, she found out that the Beak Mafia goons took all the money, and were especially cruel to his staff preparing the turkey. Then the turkeys found out that another Iron Chef, Chen Kenichi, had opened a restaurant on the recursion of San Fransokyo. Morimoto overheard the trio of terrorizing turkeys state that they were going to "show that despicable Chen Kenichi who's boss" and then quickly departed the restaurant, cash in hand. Morimoto didn't have to ask Agent Dingo for her help, it was already implied as all Iron Chef's are members of the Estate. But Agent Dingo would need a crack team of operatives for this mission, especially since she had never been to San Fransokyo. So she had her two assistants, Agents Crystal and Arianna Cosmo, wrangle up some fictionally leaked agents: Jessica Fletcher, Horatio Caine, GLaDOS, and the Doctor were all willing to help. It only took a quick phone call and then a flight on special Estate supersonic jet to get Agent Mark Sanchez to Philly after trouncing the Dallas Cowboys earlier that Thanksgiving day. "I have a death ray and we have places to be," growled Jessica Fletcher as her grip continue to tighten. "I'm not getting any younger, and we gotta get things done!" The owner pulled the keys to his truck out of his pocket and dropped them on the floor. When J-Fletch finally released the poor man, he was rubbing his neck. The Brash Vector's grip was so unbelievably powerful that it tore at the shop owner's flesh near his neck. As the team left the market, Mark Sanchez, still wearing his full uniform, pads, and jersey (Eagles gear doesn't ever translate, it always enters a recursion "Green") autographed the bloody chest of the shop owner. With a wink, the quarterback was gone. The pickup truck parked in the back of the market was a piece of crap. There was only a single wheel in the front, and two in the back, and the cab only had seating for a pair of Estate Agents. GLaDOS pulled her mechanical body behind the wheel while the Doctor insisted on riding shotgun. Agent Dingo, J-Fletch, Caine, and the Sanchize all piled into the bed of the truck as the vehicle set off down Hill Street… aptly named since most of it was at a near 45 degree angle heading towards the bay. While the vehicle was slowly moving along in traffic, J-Fletch started looking at the stun. It seemed like something passed in front of the bright orb for a moment, but just for the briefest of seconds. Thinking that something was amiss, the Brash Vector ducked, just when a massive, two-hundred pound turkey slammed into the vehicle! It missed Jessica Fletcher and instead struck Agent Dingo, dragging her out of the vehicle. GLaDOS wasn't aware of what just happened in the back, so when Dingo was pulled free of the bed and rolled, she was in turn run over by the team's newly acquired vehicle. Agent Dingo shook her head and stood up. There was a tire print on the back of her fine leather jacket now. Exasperated, Agent Dingo lifted her nose up into the air so that she could sniff out the turkey. With her new animalistic qualities in San Fransokyo, nothing could hide from Dingo's snout! Agent Dingo slowly walked across the street towards an abandoned coffee shop. That must be where the turkey went, and Agent dingo turned to…. Agent Dingo got hit by a trolley. She should've been watching where she was going. "Rub some dirt on it," Sanchez told Agent Dingo as he casually walked by. The rest of the Skeptical Spinner's teammates picked their leader up off the ground and sat her down on the sidewalk. The abandoned coffee shop was nearby, so while GLaDOS and the Doctor tended Dingo's injury, Horatio Caine grabbed Sanchez and J-Fletch and scouted out the building's entrance. The door was ajar, with a single turkey feather laying right in front of the portal. Caine feared that this was a trap, but Mark Sanchez didn't feel like checking. The Impulsive Vector lifted his cleat and kicked the door in, but quickly fell over as an explosive poison gas cypher was detonated. The foul powder covered everything, forcing Caine to cover his mouth and run back towards the street. Caine turned to Sanchez to see how he was doing, and found that the quarterback couldn't get enough of the horrible poisonous dust. Sanchez was kneeling on the floor, scooping up piles of the powder and snorting it up his nose. "That sweet, sweet turkey poison," the Sanchize proclaimed. "On the street they call it T-caine!" Sanchez was going to crawl further into the room, but Jessica Fletcher grabbed his jersey and pulled him back. The old novelist had a flashlight, which she pointed into the shop, revealing several tripwires ahead. But as soon as J-Fletch mentioned the possibility of more poison gas, Sanchez forced his way in and set off the remaining gas bombs. The poor QB was hooked! While Mark Sanchez continued to huff turkey poison, Caine grabbed J-Fletch's flashlight and moved towards the shop's back door. The Sharp Eyed Spinner kicked the door open, but only revealed a chamber of old coffee cans and garbage. That's when the Horatio Cain heard the click of a revolver. Slowly turning around, Horatio saw a massive turkey holding a .38 Chief's Special to the head of Eagles Quarterback Mark Sanchez. "One move and he gets it!" shouted Dominick DeCocco, in an old-timey gangster accent. The turkey was wearing a full suit with holes cut out for his massive wings. Horatio Caine was still wearing sunglasses while scouting the old coffee shop, but could see that the turkey's grip on the gun was rather weak. He reached up to take his glasses off, but as soon as Caine touched the side of his sunglasses a beam of energy flashed out from the lenses, shooting the gun from the turkey's hand. "YEAAAAHHH!!!!!" screamed out as the beam of brilliant energy illuminated the entire room. The turkey was clearly rattled, and flapped violently as the pistol slipped form his grip. Before he could recover, however, Jessica Fletcher was in the room, brandishing a wicked looking death ray. A single blast of the horrible purple and black energy scorched a hole in the turkey's wing. DeCocco seemed be losing the will to fight, and was just on the verge of surrendering when GLaDOS burst in and used her portal gun to create a never-ending hole, from floor to ceiling, that the turkey fell through. As the injured turkey reached terminal velocity, unable to flap his wings due to his death ray burns, he came apart and liquified. Only left with a puddle of flesh and feathers, Horatio Caine sifted through the mess for a clue. The turkey had been wearing a fine suit, and pinned to the lapel was a single red flower. Hoping this clue could lead to Gorlomi's gang, Caine got the rest of his crew back in the truck and drove a few more blocks down Hill Street until arriving at Blake's Florist. Blake was a multi-classed Florist/Surfer, and while his laid back attitude worked for his clientele, it annoyed the Estate Agents. Asked about the flowers, Blake admitted in his relaxed tone that there was a really short man who entered the store earlier and purchased three flowers. Agent Dingo asked if there was a camera, but Blake didn't want to let the investigators see the video… at least not without some payment. Horatio Caine pulled a stack of ones out of his back pocket and made it rain all over Blake. The man was basking in the glory of crumpled, slightly moist one-dollar bills, and just turned his monitor around so that the party could get a look. GLaDOS and the Doctor hacked into the machine and started searching the footage from the day. Sure enough, a short yet massive, turkey-esque looking gentleman donning an Abraham Lincoln mask made the purchase. There was a vehicle outside, a white sports sedan, of which the hackers also took note. It was about that time that Horatio Caine reminded his teammates that they had to get moving. Time was of the essence, and who knew when the Gorlomi crew would strike Big Yamato Fusion! When the team finally pulled up to the restaurant, which was situated on a pier just over the bay, they feared they were too late. The sporty yet practical white sedan was already parked in the lot, but inside the restaurant everything looked normal. The waitstaff was active and people were enjoying their food. The Estate Agents put their heads together for a few minutes to formulate a master plan but Jessica Fletcher soon grew tired of the debate. Whether it looked normal or not inside the restaurant, something bad was going to go down. J-Fletch grabbed her melt-all cypher and simply walked up to an exterior wall of the restaurant, followed by Mark Sanchez and GLaDOS. The Brash Vector smashed her vial of clear fluids on the top of the exterior wall, which started to dissolve. When a hole large enough for a 6'2" quarterback appeared, the Sanchize erupted into the room clutching a football. With a flick of his wrist, Mark Sanchez signed the ball and then threw it right into the face of a nearby waiter. The man toppled over unconscious. "He's got no hands," the Sanchize stated. GLaDOS and J-Fletch also entered the room, and started looking for turkeys, but none were clearly visible. In the back of the building, Agent Dingo, the Doctor, and Caine entered, forcing their way past head chefs and sous chefs, prep staff and dishwashers. Nothing was amiss, but at the center of the restaurant, standing at the sushi bar was Iron Chef Chen Kenichi, mouth agape at the extreme methods the Estate agents were using. "What are you doing to my restaurant!?!" screamed the Iron Chef Chinese. But Horatio Caine just ignored the Iron Chef. He scanned the room and quickly thought up a plan. Since the turkeys were so short, they should easily stand out. "Everyone stand up!" Caine shouted. "Let's see who's got the short end of the stick." On the far side of the restaurant there were two diners who weren't standing… and each was wearing an obnoxious Abraham Lincoln mask! Caine popped a Mentos (a telepathic cypher) and gave another to Agent Dingo as the two investigators approached. Not only were the pair of masked gentlemen wearing the correct mask, they were also sporting red flowers. But they refused to stand. Carefully, Horatio Caine bumped up against one of the suspects and slid an enslaving ring cypher onto his right talon. Agent Dingo asked the charmed suspect about their plans, and he started coughing up all the goods. He told the investigators that a whole bus of goons was coming, and that the agents would have to act fast to not be outnumbered. When the other suspect, the turkey known as Enzo Gorlomi heard Antonio Margheriti start spilling his guts, he whipped out his own revolver and got ready to use it. But The Doctor and J-Fletch were all over Gorlomi! The Doctor pulled off his Converse sneaker and threw it at the gangster, and for some crazy reason, the turkey dropped his .38 and plucked the flying shoe from flight. Things then got a little crazy. J-Fletch went to use her death ray on the turkey, but it exploded in her hands. Mark Sanchez had been sporting a sawn-off shotgun, and he loaded a gas-cypher shell but when he fired it at point blank range, it not only gave the Gorlomi temporary amnesia, it gave the QB amnesia as well. Agent Dingo wanted to finish things quickly, and her powerful Cell Disrupting Hair Dryer cypher could've done the trick but she missed. Gorlomi then started reaching for a cypher. Just before approaching, Horatio Caine noticed that the two suspects had been bristling with terrible cyphers and he desperately shouted to J-Fletch. "He's got cyphers! He's got cyphers!" The next part played out in bullet time. Still reeling from the exploding death ray, Jessica Fletcher dropped the broken pieces of her device and locked eyes with Enzo Gorlomi. Charging forward, the Brash Vector slid to a stop just a few feet from the notorious turkey gangster and completed a perfect roundhouse kick, snapping the bird's neck. It was finished. Horatio Caine quickly called the local San Fransokyo police to let them know of an impending robbery at Iron Chef Chen Kenichi's Big Yamato Fusion, while Agent Dingo put Antonio Margheriti into custody. As the team left the restaurant on the pier the sun was going down on this festive Thanksgiving. Jessica Fletcher was quite pleased with her skills, and with her eyes silently commended Mark Sanchez. Then they high-fived. J-Fletch then turned to Horatio Caine, and locked gaze with the hard-boiled CSI officer. Slowly the two moved together and embraced, fiercely. Strongly. After a long, languid kiss, Jessica Fletcher and Horatio Caine looked out over the bay. "And every time he shoots laser beams they go 'yeaaah!!!'" - Rachel discussing Horatio Caine's power. Rachel: "I will speak with that fowl merchant." Tom: "He hasn't done anything wrong yet!" "Alright guys… we need to find that chef before his goose is cooked." - Horatio Caine. Carmel: "I'm just saying, I never saw a turkey dive bomb out of the sky." Tom: "That's cuz nothing lived to tell about it." Jim: "He had a single red flower on his lapel." Tom: "He's just classy, that's all." "I look like Olivia Newton John in the Physical video." - Carmel decided that J-Fletch would run from the florist to the restaurant and not take the car. Okay, I'll admit that this game was a little silly, but that's what happens when you put this crew together. To be honest, by the end of the game the players were starting to play for "quotes" over experience points, but that's what makes these holiday one-shots so special. Who knows, maybe we'll get another chance in the future to see J-Fletch and Caine in action. Perhaps their Honeymoon will be spoiled by some murder most fowl! We had an incredible time with the new foci as well, and only a few minor modifications were made in play. Brandishes a Death Ray seemed to make a bit more sense if the user was "trained" in the death ray, otherwise the payoff didn't seem worth the risk. Also, I had to seriously tone down my daughter's expectations with GLaDOS's portal gun. For an 8 year old player it was no big deal, but if you are going to allow another player to choose this focus, be careful that they don't abuse it. Or at least consider using lots of GM intrusions! If you enjoyed these new foci, and would like to check out the other 94, you can hop over to DrivethruRPG and pick up Ryan Chaddock Games' The Translation Codex RIGHT NOW for just $5! You'll be glad you did! The last time I ran Council of Wyrms it was 1999 and I was at a gaming convention at Lehigh University (EPIC). The last time I ran AD&D 2nd Edition was in the summer of 2000 just before D&D 3rd Edition came out. So this particular game of Council of Wyrms is both my return to the Io's Blood Islands as well as my return to THAC0. Making characters with the kids, the nostalgia was rushing in pretty quick! It's Thanksgiving Weekend and I'm in Smyrna, Delaware hanging out with my parents (who live here), wife, and kids. Running 2nd Edition AD&D was a last minute idea, as I had originally intended to just run The Strange this Saturday for a few members of my family. But in the last minutes before packing up my stuff, I realized that we had a free night Thanksgiving Eve and I wanted to do something special. So I got up early in the morning and started making characters for the family. My parents were easy. They were both at work, so I made them identical Crystal Dragon twins. I made one character and then just duplicated it… yeah, I was cheating, but it saved me some precious time. Evie wanted to play a purple dragon (Amethyst), and Cooper a red, while Carrie wanted to have a dragon capable of breathing ice, casting spells, and being at home in the cold. Yes… she wanted to play the draconic version of Elsa from Frozen. Carrie scored an 18 in Intelligence! My wife Jen came up with a Brass Dragon that she thought could be named Knuckles. Knuckles the Bad Brass Dragon. Sometimes I'm not sure that she and I are much better than the kids with our terribly childish senses of humor. I was pretty surprised at how long it took me to make the six characters. I started around 11am, and by 1:30pm I was still plugging away. Part of this was because I hadn't made an AD&D 2E character in years, and the other is that dragons are far more complicated than humans or demi-humans. When making a dragon-PC in Council of Wyrms, the end result, just a hatchling, can have between four to nine hit-dice. Since Saving Throws, THAC0, and some casting abilities are based off of the HD and not the XP level (for Dragons that's one to twelve, based on the age categories), I should've figured that I'd be sitting on the laptop for quite a while. Although I rolled for my parents, I let my wife and kids roll their own characters. I was easy-going on the die rolls, giving them 4d6 drop the lowest, but I made them take the stats in the order that they were rolled. It still ended up working out very well. 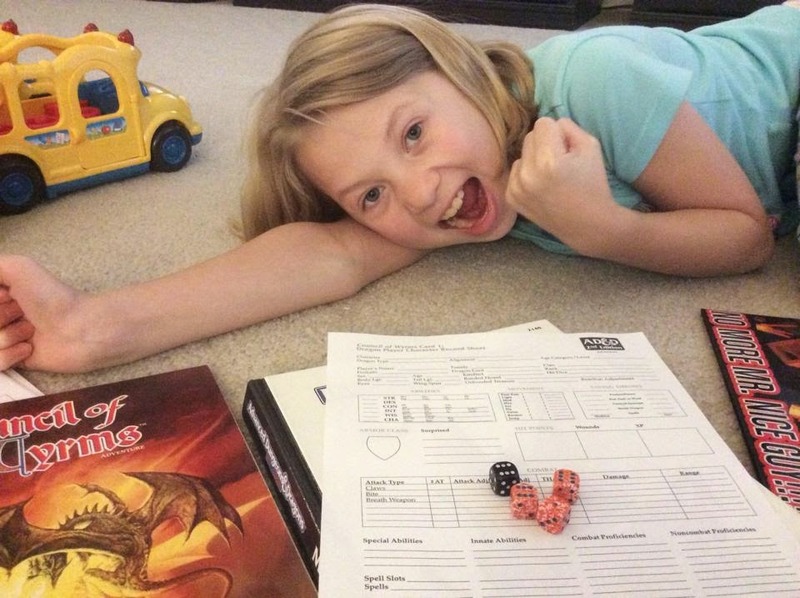 My daughter Carrie rolled an 18 for intelligence, which caused her to shout out with excitement since she wanted to play a Dragon Mage. Evie had stats perfect for a Dragon-Priest, and after a little coaxing she chose the scaly cleric. Character generation in 2E takes some serious time! Six cute little dragonlings broke through their shells, ready to embrace the world. For months, stewards and custodians of the Council Aerie cared for the eggs, with hundreds of demi-human hours spent on each and every leathery orb speaking, singing, and chanting lessons and lore. But the time of hatching was special, as the baby dragons would finally meet their draca - their mothers. But when Frostburn, Violet, Chica, Knuckles the Bad, and the twins Bima and Bromi erupted from their shells, the only voices they heard were deep, guttural and unusual. Chica, having been trained in many languages by his own dwarf egg-custodian Fredericko, instantly recognized the language as Ogre. The warm, yet dry chamber that held the six newly hatched dragonlings was eighty feet across, lit by enchanted sconces, and had three passages leading out. On the far side of the room several dead gnomes lay on the ground. There were still some unhatched eggs in the room, but right in the center a pair of brutish ogres were loading eggs into massive wagon. Knuckles wasn't about to wait around and get carted off by some wannabe-giants. The brass dragon with an attitude tried to put himself back in his shell, punching his feet through the other side so that he could approach the ogres masquerading as an unhatched egg. Unfortunately, Knuckles wasn't that sharp, and when he got close to the ogres, he was instantly grabbed. The ogre lifted Knuckles into the air and started to shout and laugh in Ogrish. Knuckles turned to Chica, "Hey Red, what are they saying?" Chica just glared at his associated but kept his mouth shut. "Chica! What are they saying! Don't you speak Ogre?" "Not today," replied Chica. The red dragon was playing with pieces of his shell, and just looked down, ignoring the brass dragon's plea. One ogre was preparing a large sack and some wire while the other continued to jostle Knuckles around. The pair of bestial brutes didn't seem to know that even a baby dragon was a very dangerous foe. Knuckles the Bad Brass Dragon breathed in deep and then let out a massive belch of sleep gas, knocking both ogres out instantly. Frostburn, Violet, and Bima darted out from behind their shells and started scouting the room. There was a hallway to the west that seemed to smell of dragon kind, and Knuckles and Bima started arguing over whether or not they should just flee and find help when Violet heard a voice call out in pain. Her name was Sviliffa, and the little gnome custodian reached out her hand towards the dragons. Bima was the first to approach, but when the gnome tried to pet the face of the hatchling the crystal dragon backed away. The dying gnome explained that she was one of their caretakers, but that the ogres had broken into the chamber and were taking the eggs. Sviliffa begged the dragonlings to stay and protect the eggs from the remaining ogres. There were secret passages connecting the each egg chamber that the dragonlings could use to their advantage. When the gnome passed out, Violet realized that she could call upon the dragon-god Chronepsis for divine healing. The amethyst dragon placed her hand upon the torso of the gnome and instantly the little custodian's wounds were healed. Now it was time to take on some ogres! Frostburn the Dragon-Mage took the lead and scouted the easternmost chamber. It was seventy five feet wide by one-hundred and fifty feet long, full of unhatched dragon eggs. On the far end was sloppily dug hole, most likely the way that the ogres broke into the chamber. There was another cart, and three ogres working to fill the wagon with eggs of all kinds. Frostburn wasn't about to let anymore eggs get taken, but she knew that the dragons needed information. The ogres were close enough that the silver dragon could use her paralyzing gas to put them down. Frostburn let out a burst of her breath weapon, however it only worked on two of the ogres. But the third was no match for six, trained-in-the-egg, combat ready dragonlings. Before Biff the Ogre could swing his club he found himself encircled by five snapping little baby dragons. After taking several claws and bites, Biff started looking towards the exit, and made a few steps before Knuckles appeared right in his face. Biff was groaning, and Knuckles, using his skill at singing, was humming along, mockingly mimicking the ogre's moans of terror. With one claw, the Bad Brass Dragon grabbed the ogre's throat and ripped it out. "I guess I won the sing-a-long," declared Knuckles. Yancy and Ulfgarr watched in absolute horror, unable to move but completely aware of what the little dragons were doing to their associate. "I don't think this was a good plan, Yancy," Ulfgarr whispered to his brother. "No, Ulf… I think the boss bit off more than WE could chew. But who knew the little lizards would wake up?" said Yancy. "Oh no, they're coming right for us!" Knuckles, the absolute last dragon anyone would want to meet in an interrogation chamber, dragged Yancy the Ogre to the center of the room and each dragonling started shouting in different languages at the monster. Chica was still the only dragon who spoke ogre, but he was busy drawing on one of the cave walls with some chalk he found, mixed with ogre blood. But Violet spoke a little giant, and it seemed like Yancy knew a few words as well, and was quite willing to chat with the newborns. Yancy spilled his guts figuratively so he wouldn't have to face the literal alternative. The ogres broke into the Council Aerie in order to steal eggs for the Frost Giants to the north. Krug Bonebreaker, chief of the small ogre tribe, had been successful on several raids outside of the Aerie, and hoped this excursion would be several times more lucrative. Yancy told Violet that the rest of the ogres were in the two northern chambers, just before Knuckles put him down like the dog that he was. Frostburn and Bima slew the other. Knuckles searched for a few animals to speak with, since she could communicate with them, hoping to get some help getting some of the eggs to safety. She managed to find a pair of honey badgers, and asked for their assistance. But the honey badgers just left the chamber. They didn't care. Frostburn pointed the rest of the hatchlings towards the northern secret passage, and Knuckles took point. On the other side was another hatchery, with three more ogres and another couple dozen eggs. Sticking his head out the other side of the hidden pass, Knuckles blasted two of the ogres with some searing desert heat. Although it seemed to wound the ogres, it didn't take them out, and both turned toward the tunnel and threw spears at the brass dragon's head. Pierced twice, Knuckles started shouting and cursing, while yanking the spears out of his tough, but baby-soft scales. Knuckles threw both spears back out of the passage, but only managed to graze an ogre. "My turn!" exclaimed Violet, who stuck her own head out and coughed up a glowing purple lozenge, spitting it across the room where it exploded right in the middle of the ogres. The explosive blast shattered two of the bestial humanoids, and paralyzed the third. With a chipper smile on her fang-laden visage, the amethyst dragon strolled right up next to the incapacitated ogre and chewed his face off. The rest of the dragons entered the room from the south, but heard footsteps to the west as the rest of the ogres arrived. Krug Bonebreaker had heard the exploding lozenge along with his seven associates. "What's this?" the ogre chief shouted. Her fangs still dripping with ogre blood Violet turned to the chief and just whispered, "Hi." Krug's subordinates started to shake and quiver at the eerie sight, but Krug was made of tougher stuff. "They're just babies, you fools! Charge!" Seven ogres ran out in front, followed by their spear-toting commander. But before the ogres could close the distance, a wall of combined breath weapon attacks burned, froze, and pierced each of the bestial warriors. The dragon hatchlings had lined up in formation, each one expelling a breath attack in unison. Desert heat from Knuckles, freezing cold from Frostburn, blazing flames from Chica, and shredding crystals from the twins Bima and Bromi. Those fortunate ogres who survived the combined attack were slain by cute little Violet, who used her claws to tear the remaining survivors apart with her crystalline claws. Krug was defeated, and grabbing one last egg the ogre chief tried running out of the chamber only to end up facing Bromi. The little crystal dragon was only six feet long, compared to the massive chief, but was a well trained martial master. Bromi slashed out with both claws and with a fierce bite tore the ogre's head from neck. The baby dragons had won! They protected countless eggs from the clutches of the evil ogres, while gaining information about a Frost Giant threat from the north. Sviliffa was saved, and with her restored vigor she escaped the first chamber to get Mykell, the highest ranking dragon in the Council of Wyrms. The majestic Amethyst Dragon entered the hatchery and peered down at the six babies. "Good work, little ones, but do not be too sure of yourselves. Consider this your first test… there will be others." Jen got to use her new Steampunk dice from Q-Workshop! "Trying to describe fantasy scenes with Mambo Italiano in the background is difficult." - Jim pleads with the rest of the family, after asking for mood music and getting the Dean Martin channel. "The chalazae in an egg keeps you centered!" - Carrie starts reciting biology during the hatching sequence. "Ricolaaaaa!" - Jen, remarking on the Amethyst Dragon's explosive "lozenge." Jim (as Ogre): "We're following our lord Krug Bonebreaker." Evie: "That sounds like my friend Dylan's dad!" "I hate D&D!" - Jen missed bennies from Savage Worlds and Experience Points from Numenera/The Strange. Just a glorious and captivating Dungeon Master! I've run Council of Wyrms a total of six times (well, now seven), and this particular adventure (Not the Draca) three of those times. It is a great game to try out if your crew needs a break from their fighters, mages, and elves, but I've never had the opportunity to give it a long-term run. One significant reason is the XP system. To get to the next level a dragon needs to meet three requirements: Age, XP, Hoard Value. Smaller, weaker dragons need less XP to advance. So while a weaker dragon may only need 64,000 XP, a larger may need twice, or even triple that. But it doesn't make much sense to put one player on a break while the others play. You could alternatively make every player the same kind of dragon, fixing the XP issue, but that would be dull for the players. Still I'd love to find a way to run this game more often, and do a complete campaign just for a change of pace! The opportunity to play a dragon, even a hatchling or young drake is just awesome! If you'd like to give the game a shot, follow this link to purchase a PDF copy from DrivethruRPG. You could also find a used copy on Ebay or Amazon.com, or possibly at your local used book store. You'll need an AD&D 2nd Edition Players Handbook, Dungeon Master's Guide, and Monsters Compendium. I need to put this out there before we get started: I don't like old movies. As a child of the 1980's and early 90's, movies that I would consider classics are along the lines of the Terminator, the Beastmaster, and pretty much anything featuring Patrick Swayze. Sure there are a few old flicks that I'll watch, like Patton or Spartacus, but luckily they are in color! I guess that pretty much sums up my issues with old movies… I never really liked early black and white cinema, and it was that particular block that kept me from watching anything predating "I am Spartacus!" 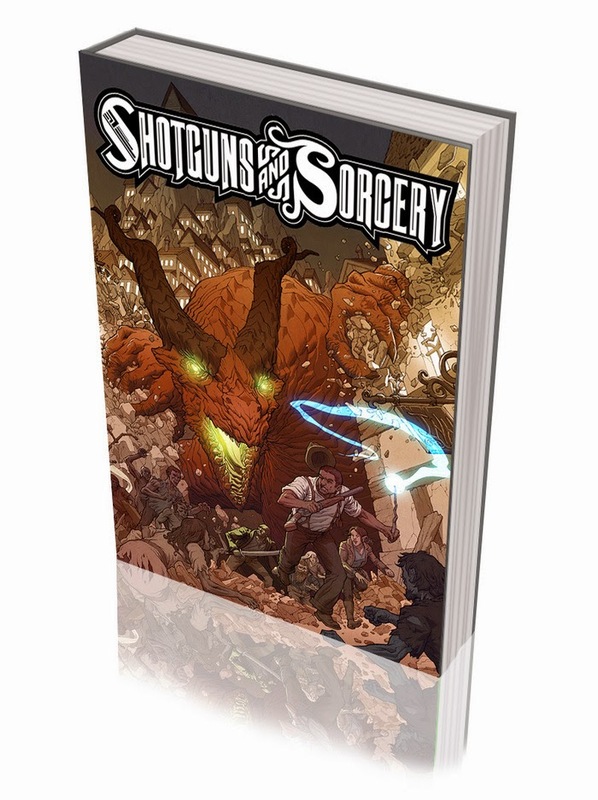 So it may come as a surprise to some of you who know me that I dropped my cash on Outland Entertainment's Shotguns & Sorcery as quickly as I did. For a game that is being promoted as "The Fantasy Noir RPG," someone who can't stand watching James Cagney or Humphrey Bogart on television couldn't possibly be interested. Thankfully, modern cinema has been doing film noir so well in recent decades that I don't need to turn to Turner Movie Classics to catch some hard-boiled detective cracking a case, or that gangster with a heart of gold leaving the girl he loves behind. For me, film noir (technically Neo Noir, I guess) is Mel Gibson's Porter, in Payback, hunting for his "seventy-grand." It's Harrison Ford as Rick Deckard tearing at his own, possibly synthetic, psyche while gunning down replicants. It's Hellboy on another job for the Bureau of Paranormal Research and Defense. It's Marv, standing in the rain, looking for the next victim of his torturous street justice in Sin City. I plan on bringing this feel and flavor of gritty back alleys and crooked cops to my players with Shotguns & Sorcery, and you should seriously consider joining me. What is Shotguns & Sorcery? I only discovered Matt Forbeck's work in the past couple of weeks, and so far have read the first short story "Goblintown Justice", so my descriptions may not be as accurate as those of you who have poured through the entire series. A couple of years ago Matt Forbeck wrote three novels and two short stories set in the fantasy noir setting of Dragon City. In this world, the undead infest much of the world, and only one city, ruled by the Dragon Emperor, stands as a bastion of civilization. The technology level seems to be a blend of early 20th century, with magic being used in everyday life. The hero in Goblintown Justice, Max Gibson, carries a wand the same way a detective has his trusty revolver, and the cabbies use magic carpets. The rich in Dragon City live in the center, while as you move closer and closer to the edges, and the moans of zombies, civilization breaks down into slums like Goblintown. Shotguns & Sorcery is special for another reason, as Outland Entertainment seems to be the first third party publisher to obtain a full license of Monte Cook Games' Cypher System! 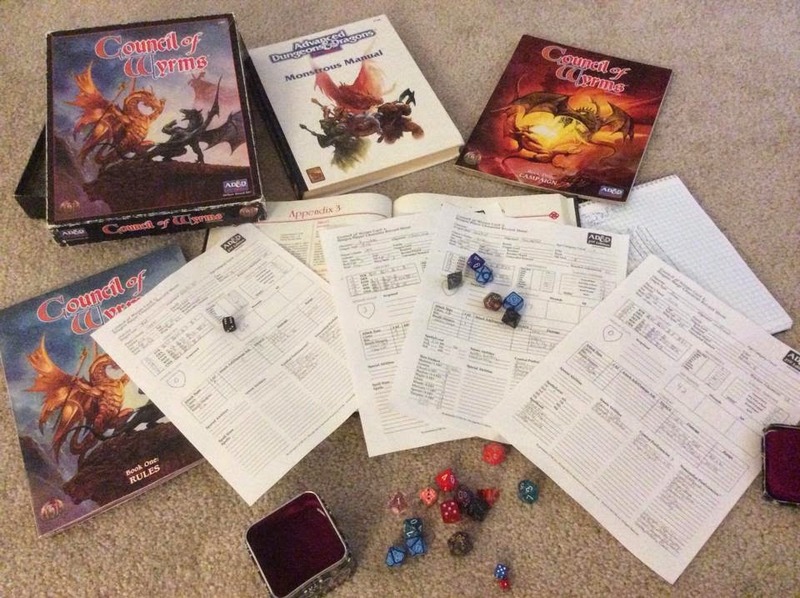 If you are a regular reader of my blog, you know I'm already a raving fan of the Cypher System, so I'll spare you the lengthy lecture on why it is such an extraordinary RPG mechanic. Monte Cook Games has released two settings for the Cypher System, including the award winning Numenera, and the recently released, hot-off-the-presses The Strange. Both of MCG's games are cross-compatible, and share many features that can be used in either setting. This means practically any book that comes out is a must-buy even if you prefer one setting over the other. I believe this to be the case with most of the third-party products as well, which is why my excitement level for Shotguns & Sorcery is through the roof! With Matt Forbeck providing the original source material for this awesome looking setting, the founder of Outland Entertainment, and incredibly talented artist Jeremy Mohler is bringing the creative muscle. 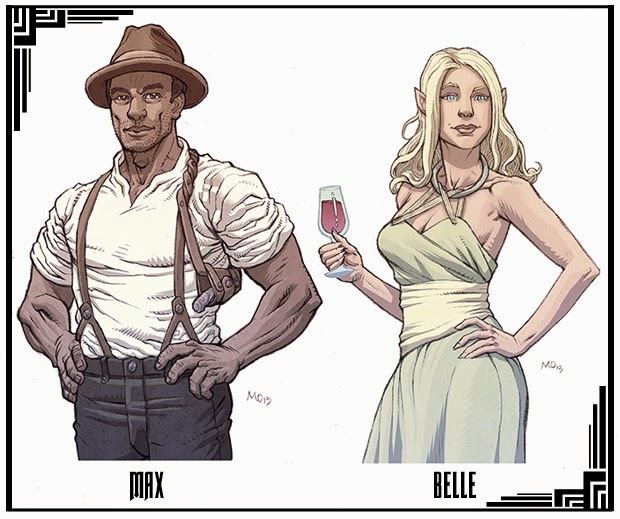 Included in Outland Entertainment's team are Susana Grilo, Edward Lavellee, William Ward, and Emily Hall. I have to give a special nod to Numenera veteran Robert Schwalb as well, as Outland Entertainment is bringing him on board to help translate Shotguns & Sorcery into the Cypher System. If you are already familiar with Numenera, Schwalb worked on Numenera Character Options and the Technology Compendium: Sir Arthour's Guide to the Numenera. I actually have a serious grudge against Mr. Schwalb due to his original Numenera adventure Beyond All Worlds, which was screwed up beyond imagination and left Serbrus Ton'bur (my Doomed Glaive who Consorts with the Dead) a complete wreck of a man. One day we will meet, Mr. Schwalb, and words will be had! All kidding aside, with all of this talent, we are in store for a real treat! I'm going to direct this part of my post towards the existing fan base of Numenera and The Strange. Even though this game is a ways off from being released I wanted to share a few ways that I think it could be useful at your game table. The first way is obvious… just play the game the way it is! 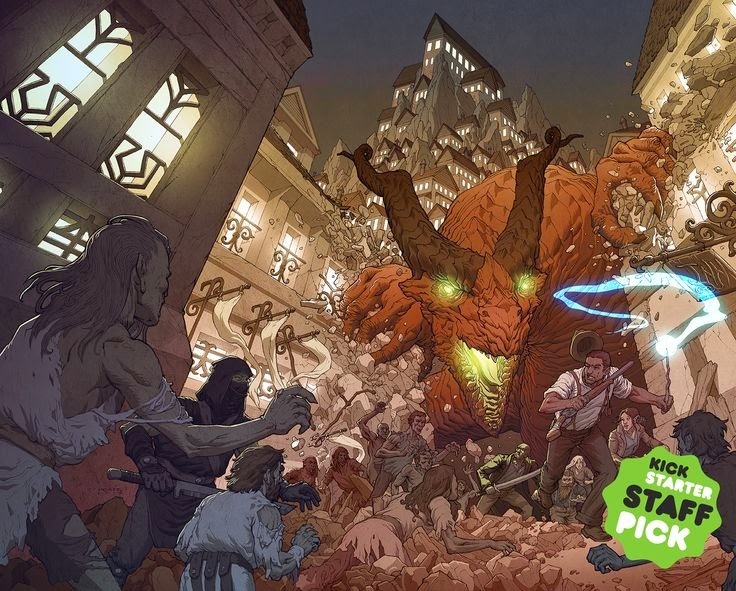 The campaign setting sounds amazing, and if you are looking for something "Cypher'ish" that doesn't involve the Dark Energy Network or bits of technology a billion years from now, this could be a great way to change things up at your table! I'm sure Dragon City would make for an awesome, and very different recursion in The Strange. Although we already have some magical recursions in The Strange, Dragon City feels nothing like Ardeyn. I could see agents of the Estate having to deal with the elves of the Dragon Guard, and take part in magic carpet chases when their suspect gets away. If Numenera is more your fancy you could always try something a bit more… weird. In the Numenera Bestiary there is this great robotic/monstrous "thing" called a Latos. Instead of a head, a Latos has an entire city for a head. The head is pretty big, but probably just a dozen feet across or so, which means the city exists in sort of a TARDIS-esque "bigger on the inside" kind of way. So maybe your Jacks, Glaives, and Nanos find a Latos who is carrying around Dragon City on its shoulders. I'm backing this project for three reasons. First, while I hate "evil campaigns", I love crime-based adventures. I think having a party of private investigators dealing with corrupt officials and getting double-crossed by old friends just sounds awesome! Makes me want to re-read all of my Sin City graphic novels right now! Second, as a fan of the Cypher System, its important to support the game system and associated projects, especially when they have so much promise and potential. The pitch video by Matt Forbeck and Jeremy Mohler was very well done and captured my interest immediately. I think this is going to be a fun ride. Finally, the backer rewards are both reasonable and generous. Just the $50 level gets you a hardback and PDF of the 300 page RPG, as well as three novels and two short-stories on PDF. So if all of this ranting has captured your interest go check out the Kickstarter. If you'd like to get an idea of what the setting is like, the first short-story, Goblintown Justice is absolutely free to everyone, backer or pre-backer! If you decide to double-down and become a backer like me, make sure to spread the word! That's when we as fans get to support the products and projects that WE want! *** Please note that all of the artwork in this blog post is courtesy of Outland Entertainment… although the photo of that amazingly attractive detective is me. It's been a while, feels great being back! If this is your first time reading our Avernus Availed stories, please feel free to check out previous posts before reading ahead! WFF - Witchmark Friends Forever! Five brave adventurers arrived in Augsing early one morning, in search of glory and treasure. Foul terrors plagued the world of Morden for decades, and despite rumors that some of the horrific Accursed had returned to society in order to battle evil and defeat the Witches, Ramel Ramelson would have none of it. All Accursed were to be destroyed! The Dwarven War Priest was a sworn monster slayer and experienced adventuring party leader, having gathered a crack team of heroes from all across Valkenholm: Fox the Elven Ranger, Merula Lanus the Mage, Gar Ironhelm the Warrior, and Marcus Two-Hands the Thief. Ramel's contacts in Augsing reported that several members of the Avernus family had returned from the Bane War as Accursed, taking up residence in their ancestral home to the south of the city. All three family members were cruel and malicious undead, who lived in a house infested with mind-controlling rats. Just recently the three hellspawned undead infiltrated a local crypt, freed a spider-demon, and brought it back to their estate as a new ally. Yes, the Avernus's had to be destroyed, and their home burned to the ground. … oh yeah, I think we're coming at this story from the wrong angle… I can fix that. Avarice Avernus was rather thrilled this evening. Two of her dear friends and compatriots during the first months following the Bane War, Cole and Rogan, were coming by to visit and perhaps stay at Muridae Manor. You see, life for a member of the Accursed was difficult in Morden. Even though they were free to try and battle the Witches and thus save their own souls (which incidentally usually meant helping out local towns), members of the Accursed still got very little respect. So Cole and Rogan would probably be staying at Muridae Manor for a little while, just until they could get on their feet. Much to the delight of the Avernus Family Matriarch, her new housekeeper Arachnis (as in, the ex-Demon Spider) was also an incredible cook, and by the time Uncle Nester brought Cole and Rogan into Muridae Manor, dinner was ready. Cole, an Ophidian and partial to live food, was delighted that a live chicken was waiting on his plate, while the Vargr Rogan started feasting on a smashed pile of ground beef. For the Dhampir Annaria a few pints of blood, and Adelaide just a few peas and a carrot. Shades don't need to eat much. Avarice, a Mummy, was fine with a teacup, but since she was undead, she didn't need any actual tea. Just the motion of bringing the cup to the face of her sarcophagus armor was fine for Avarice. It truly was a pleasant dinner. That's right about when Uncle Nester had to interrupt and alert the Avernus family and their guests to a situation that was brewing outside. An adventuring party was approaching! Very quickly Annaria led Cole and Rudolpho to Muridae Manor's tower, taking the stairs while Adelaide followed behind, becoming incorporeal so that she could pass through the floors. A straight line is always the quickest! From atop the tower, Annaria took a look north and saw a quintet of brave heroes, three humans, an elf, and a dwarf, approaching the home. Annaria was an incredible scout during the Bane War, and could've spent a few moments silently observing the adventurers learning their weaknesses. But the chipper half-vampire thought that a warm welcome was in order and called out a greeting. The adventuring party's mage summoned forth a blast of explosive skulls that detonated right in poor little Annaria's face! While Annaria shook off her newfound headache, Cole grabbed his longbow and daggers and ran to down the building's wall towards the adventurers. When the Ophidian reached the end, however, they were gone… or at least they seemed gone. A pair of daggers hit Cole. The first bounced off of his tough skin while the second, aimed for the serpent's face, skewered Cole's hand when he brought it up to shield his eyes. Adelaide flew across the wall as well and stood side by side with Cole, looking down at the Marcus Two-Hands the Thief. She tried to summon forth a hex, throwing a stunning curse down upon the knave, but it had no effect. Adelaide turned to her teammate just in time to watch him lick one of his arrows. The Ophidian had a poisonous saliva capable of paralyzing foes, and it only took one arrow to put the Thief down. Wounded and unable to move, Adelaide hovered down and shot Marcus Two-Hands in the face with one of her pistols. So that was the end of him. Meanwhile, in the dining room of Muridae Manor, Avarice Avernus was begging and pleading with her Cranium Rat compatriots to aid in the defense of their home. Unfortunately, Rudolpho didn't seem entirely interested. Avarice figured the rats were afraid, but the reality was that they were just hungry, and there was a lot of cheese on the dinner table still. Besides, the Avernus family had this handled… pretty much. Rogan didn't seem so sure. On one side of the dining room the Vargr Berserker heard the crunch of glass and stone, while across from the chamber, just outside of the courtyard, the Elven Ranger was setting up a position to snipe. Rogan wasn't going to just sit around and wait for something to come flying through the window. The lycanthrope grabbed his hand axes and charged across the courtyard, straight into Fox. The Ranger parried the first attacks with his bow and then drew his short sword, slashing wildly at his foe, but the Vargr was too powerful. After taking a slash across the chest, giving him a rather close shave actually, Rogan put his axe into the head of the Elf and took the ears as trophies. Back in the dining room Avarice Avernus was by herself when she heard the sound of footsteps coming down the adjacent hallway. Glancing around the corner, the Mummy Duelist saw the Dwarf, the Warrior, and the Mage making their way into Muridae Manor. Avarice retreated behind the wall, and then drew her blades. With a swift kick, the Mummy exploded through the wall, sinking both her long sword and heavy rapier into the poor Mage Merula Lanus. Avarice was proud of her work as she gazed down upon her defeated enemy, but now found herself outnumbered. But not for long. Annaria had just recovered from being blasted by the Mage's spell. After unnaturally bounding down the hall towards her mother, the Dhampir carefully aimed her musket and put a bullet into the Dwarven War Priest. Annaria then dropped her musket and drew her crossbow, putting a bolt into the bold Ramel Ramelson. For the dwarf, things were not going as planned. Annaria (Evie) to the rescue! Positioning himself back to back with his Warrior associate Gar, Ramel prepared for a last stand. The Dwarf could handle a Mummy, and maybe even the Dhampir, but soon the Vargr arrived, and then the Shade, and finally the Ophidian. It was five on two for a few moments, until Ramel swung his hammer one last time. Gar Ironhelm never wanted to come to Augsing. He was fairly content just being a local town guard in Palmyria, but signed up with Ramel Ramelson because the perks were good, and there was a promise of riches beyond comprehension. But where did that land him? The poor warrior was standing in the middle of a circle of vicious and evil monsters… toying with him. The creatures kept trying to hit him, clubbing at him with staves, slashing with blades, and hacking with axes. Gar's armor kept him safe, for the most part, but the Warrior couldn't break free, even after going into a crazy frenzy. Eventually there was nothing he could do, and when the last axe slashed across his helmet, Gar accepted his soul's release. All for one, one for Monsters! Jim: "Why are you in Augsing?" Dylan: "To find food and money!" Jim: "So what do you eat?" Jim: "You'll damage your house!" Jen: "My house is already a mess… and I sleep in a sarcophagus." "I believe guests are supposed to KNOCK!" - Avarice, as she kicked through a wall and attacked the adventuring party's mage. "More daggers for YOU!" - Marcus Two-Hand's battle cry, just before blasting poor Cole. "OH YEAH!" - Jim and Craig both kept doing Kool Aid Man impressions. These kids had a rough night! Savage Worlds is an incredible system by Shane Hensley. I'm sure you've already heard of it, but if not, go give it a look! Finally, if you haven't had a chance to check out Accursed yet, please make sure to give the game a look at www.accursedrpg.com! You mean you haven't done this already!?! ?